Download our March Newsletter for tips and more! 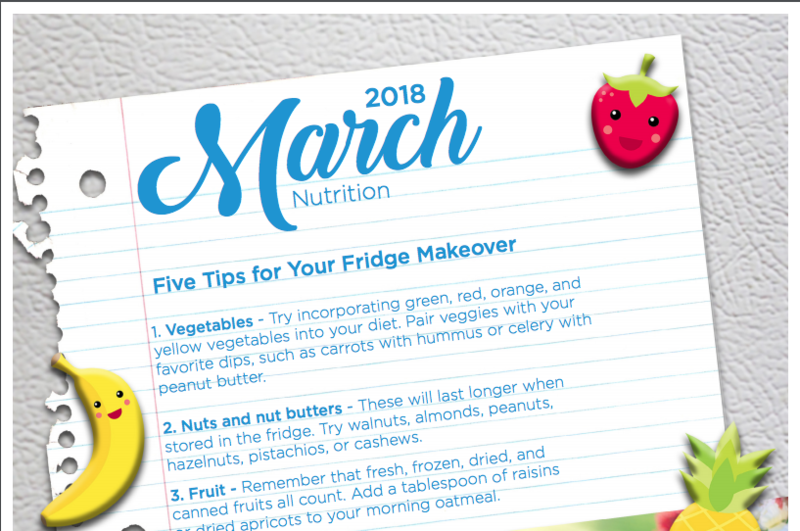 The calendar provides links to focus areas…for example, on the 4th link…’Add color to your meal with different fruits and vegetables’ takes you to a wonderful chart of colorful fruits and vegetables provided by the American Heart Association. Balanced Wellness LLC provides several programs and workshops that include nutritional strategies to improve overall well-being and reduce the risk of many chronic illnesses. Founder, Terry Gehrke, M.Ed., MCHES, CHWC holds a Plant-Based Nutrition Certificate from The T. Colin Campbell Center for Nutrition Studies and eCornell. Consider hosting a Lunch n Learn for your participants addressing healthy nutritional strategies. While they may not be interested in a Plant-Based only nutritional plan, we can all agree that more fruits and vegetables can improve our health.